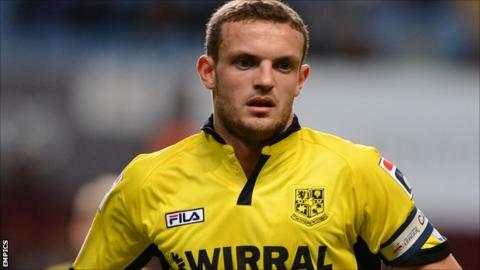 James Wallace says League One leaders Tranmere are still focused on their primary target for the season - picking up enough points to avoid relegation. Ronnie Moore's side have won five and drawn two of their first seven matches and are two points clear of second-placed Stevenage in the table. "It [being top of the table] doesn't matter too much at the moment," captain Wallace told BBC Radio Merseyside. "It's all about getting to the 50-point mark for us and going from there." The former Everton midfielder added: "We'll enjoy it while we're at the top. Getting the three points against Bury has turned a good start into a fantastic start for us." Tranmere beat the Shakers 3-0 on Tuesday, a brace from Andy Robinson and another goal from Jake Cassidy helping Rovers maintain their 100% home record. Teenage striker Cassidy has scored 10 times in 19 appearances for the club, combining his two loan spells from Wolves, including five during 2012-13. Wallace said: "Jake came here for the last couple of months of last season on loan and ended up being our top scorer, and he's continuing it this season. Tranmere play their first ever competitive match against Crawley on Saturday.